Thank you for your interest in my art. Working in the medium of acrylic, my paintings are realistic in style. I most enjoy painting landscapes and pets, and would be happy to work with you to create YOUR special painting. Here are comments received: Buyers' Comments / Commissions' Testimonies / Pet Painting Testimonies. To order note cards or inquire about my art, please contact me. Also, some of my paintings can be seen and ordered as prints, pillows, cards, etc., through Fine Art America. The Villages Daily Sun newspaper highlighted the VAA's Annual Fall Art Show on September 23, 2017 with a photo of my display. 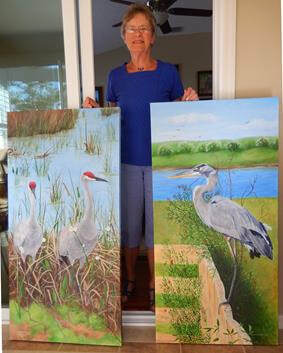 New paintings "Redheads VII" and "Heron at the Preserve" are painted in acrylic on 24"x48" gallery wrapped canvas. "Heron" was displayed at Arts Round The Square (ARTS) in October and won the Peoples Choice Second Place award.